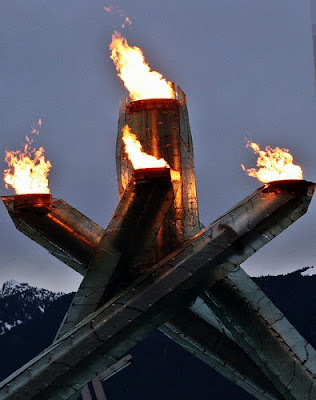 Today is the last day of the Vancouver 2010 Olympic Games and there is a feeling of sadness going on in my heart because it's coming to a close. It feels as though the Olympic spirit has touched many of us - not all of us, but many of us. It has brought many countries closer together and just today I heard someone say that there was a feeling of Oneness. The five interlocking rings represent the union of the five continents, and the colors were chosen according to the colors of each country's national flag. This union is what is so powerfully recognized when it comes to celebrating our Olympics together as One. Not everyone agrees with the Olympics. Like everything else, many will be looking for and concentrating on the dark side rather than on what the Olympics offer us. The Olympics is a celebration of humanity's connection to one another. To experience our grace when we all come together. To stand up for each other and encourage our growth, determination, and tenacity when we endure the pain of victory for others rather than just ourselves. When I say pain, I don't mean pain in a bad way, though. The pain, challenges, or struggles of moving forward, the daily disciplined practice to better ourselves, and to move beyond old habits and beliefs that restrict us. When we observe and really recognize what the Olympians are going through in their challenges to better themselves because they truly love what they do, we can definitely learn a lot from these athletes! In the spirit of the Olympics, it is ease to recognize people coming together with ease and grace, sharing generosity, friendship, and smiles :) and so here we are again left in a state of awe and beauty.